Oktoberfest at Snowbird. Sample over 50 varieties of local and international brews at this annual event. Performances and activities will also be available. Visit Snowbird’s website for more information. Petersen Family Farm Harvest Festival. Held from 9am to 4pm at the Petersen Family Farm, 11887 S 4000 W, Riverton. Celebrate the harvest and enjoy face painting and pony rides for the kids. Explore fall on the farm and visit a fall market full of produce including a variety of pumpkins and fresh baked goods. Local food trucks and live music will also be on hand. With the purchase of admission to the Harvest Festival you receive a month long entrance pass and 3 tickets each that can be used for activities and access to the Pumpkin Patch. Visit their website for tickets. Strut Your Mutt at Liberty Park, 600 E 900 S—NW corner. A walk in the park that saves lives, sponsored by Best Friends Animal Society. The event features 50+ vendors, activity zones for pets and kids, a beer garden, food trucks, live entertainment, contests, and more. Registration helps raise money to support Best Friends, or your favorite Utah animal welfare group. All animal loves, with or without a dog, are welcome. Dogs should be well-behaved and leashed, under adult control. For safety reason, please no other pets – cats, birds etc. Click here to register online. The walk starts at 12pm and the event ends at 4pm. Moab Ho Down Mountain Bike Festival. Events include bike riding, enduro racing, jump jamming, partying, and bike movie watching. This event is presented by Chile Pepper Bike Shop and the Ho Down is 100% non-profit and benefits the Moab Bike Park. For a schedule and registration go to their website. Dia de los Muertos at Thanksgiving Point, 3003 Thanksgiving Way, Lehi. Take part in a traditional Latin American Celebration. Bring handwritten notes or mementos to decorate an altar for loved ones who have passed away. The event features art, mariachi bands, and traditional dances. The event will be held October 27 from 11am to 8pm at the Show Barn at Thanksgiving Point. Visit the website for more information. Ogden’s Witchstock Festival sponsored by the Ogden Downtown Alliance, the Junior League of Ogden, and Historic 25th Street. Tickets are $25 and can be purchased at eventbrite. 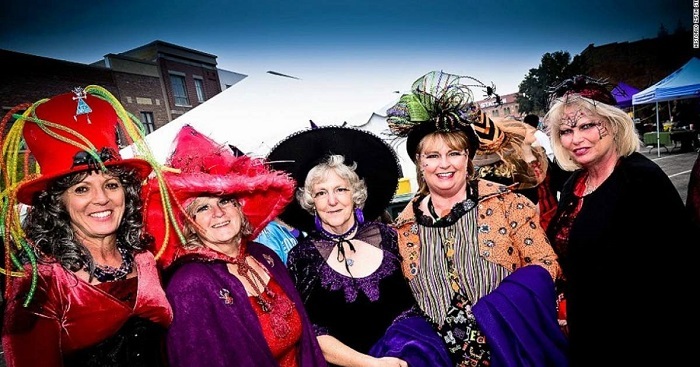 Events include a Witches Tea at 4 pm, Zombie Crawl at 6 pm, and a Monster Bash dancer party at 8pm. The event will also feature live entertainment, local art, roaming performers, vendors, and more.